He forgot "capo de tutti capo"
This picture of a bizarrely shaped room shows Arab summit host the Emir of Qatar, King Abdullah of Saudi Arabia, and President Gadhafi of Libya. It seems like a pleasant chat. Gadhafi disrupted the opening Arab League summit in Qatar by taking a microphone and criticizing Saudi's King Abdullah, calling him a "British product and American ally." When the Qatari emir tried to quiet him, the Libyan leader and current Africa Union chairman insisted he be allowed to speak. "I am an international leader, the dean of the Arab rulers, the king of kings of Africa and the imam (leader) of Muslims, and my international status does not allow me to descend to a lower level," Gadhafi said. Gadhafi, who is known for his unpredictable behavior, then got up and walked out of the summit hall. A Libyan delegate said he went to an Islamic museum in Doha for a tour. The museum is apparently excellent. Over the years, David Rivkin and Lee Casey have told Wall Street Journal op-ed page readers that torture is constitutional but asking workers whether they want to sign cards (Employee Free Choice Act) to support the unionization of the workplace is unconstitutional. Is it really a good idea, between all the economic crisis features on Bloomberg TV, for a heavy advertiser to be "Internaxx -- for offshore shares and investment funds"? Another spot broadcasts their competencies in Contracts for Difference, which helped bring down Anglo-Irish Bank. Internaxx is based in Luxembourg. Hopefully Gordon Brown doesn't watch the ads. In the space of 6 posts on National Review's The Corner you can go from Mark Steyn sighing at how Europe is shutting down freedom of expression when it comes to anything connected to Islam to Andy McCarthy demanding that cartoonists should be shut down when it comes to anything that might imply that the War on Terror as defined by the US and Israel is not a truly fantastic enterprise. And McCarthy really is arguing that such cartoons should be banned (the context is a heavy-handed Pat Oliphant cartoon), for there is no other implication from his endorsement of the view that they help "the enemy". To the extent that one can divine any principle in McCarthy's approach to deciding what gets banned and what doesn't, it's that people in Muslim countries are stupid and easily inflamed by cartoons. So he'd be in favour of any cartoons as long we're sure that those people couldn't see them. We weren't paying enough attention to this one. The Telegraph's Toby Harnden tries to sort out how the Cowen-Obama teleprompter mix-up got turned into the claim that Obama had mechanically read Cowen's speech from the teleprompter. Basically an unclear wire report got laundered through a pre-existing Obama/teleprompter narrative and became a Rush Limbaugh talking point. But note that the Irish Times report on the actual event was correct. As a general point, it's good to begin debunking such shite with some actual reporting from someone who was at the event. but Nigel Farage had already made sure that the listeners knew it was Brown's phrase before Hannan spoke. But anyway, the whole thing is worth a read -- the session was extremely lively and had a much more big picture context (Europe/G20) than a national parliament session would have had. How many Foreign Secretaries like Hillary Clinton would have to listen to their spouses say over breakfast, "Well, as I was saying to King Abdullah yesterday, ..."
Above, the irrepressible Bill Clinton with the King a couple of days ago. Since that appears to be a picture of the Grand Mosque in Mecca in the background, the Obama-hating crazies might want to extend the list of Presidential Muslims to include Bill. He's already been accused of just about everything else so he won't mind. When Czech PM and European Union council president Mirek Topolánek said that Barack Obama had put America on the way to hell, he was just calling for more discussion between the US and the EU. UPDATE: This is becoming a farce. Topolánek now says that he said "road to perdition" and not "road to hell" but also that Tim Geithner had freaked out the EU Council a couple of weeks ago. What exactly is this EU-USA summit next week supposed to discuss? Note that there still appears to be no official transcript of what he said to the European Parliament. What? The Project for a New American Century. PNAC. You remember, the late 1990s manifesto that called for the removal of Saddam Hussein and a few short years later its principals were achieving their dream, although when they wrote it, 9/11 hadn't happened yet. Life is strange that way. Head to the FPI website and the principals turn out to be Robert Kagan, William Kristol, and Dan Senor -- a more Iraq 2003-connected roster you'd be hard pressed to find. FPI is set up to get tax-deductible contributions, so it can't engage in partisan activities, but an outfit this close to George Bush is going to need scrutiny. Perhaps Joe Lieberman is giving them bipartisan cover, and impressively, they have an Irish politics expert on staff -- it's good for Ireland to provide a diversion for what would otherwise seem like a neocon project. But make no mistake: this is the Project for a New American Decade. We know how well it's predecessor worked out. Another viewer complained about a scene which shows a wheelchair-bound young boy with an oxygen mask and hooked up to a drip. The ‘weatherman’ repeatedly tells the boy to utter a catchphrase but he can only stutter and cough. RTÉ defended Nightlive as a comedy programme which parodies a fictitious news programme and insisted that the joke was really on the shallow, self-centred presenters. We were going to do a post about how there's a strain of modern Irish "humour" that relies on making fun of easy targets, but it didn't seem worth the trouble. But then we got to found out what RTE's standard is when a guerrilla artist manages to make fun of actual powerful people: the depictions of a naked PM Brian Cowen (a witty commentary on the public finances, if nothing else) get censored from the public record after they were first reported. See Damien for more. Clearly the artist didn't make enough fun of terminally ill kids to survive RTE's standards. WASHINGTON (AP) — An Irish trading company and three of its officers have been charged with sending helicopter engines and other aircraft parts to Iran. A 25-count indictment unsealed in federal court in Washington Tuesday charges the Mac Aviation Group and three men of buying the components from U.S. companies and sending them to Iran through companies in Malaysia and the United Arab Emirates ... Justice Department officials said they are seeking the arrest and deportation of the three Irishmen — company owner Tom McGuinn, his son Sean McGuinn, who is the sales director, and commercial manager Sean Byrne. The three need to compare notes with Sean Garland. As to Lenin’s question, "What, then, is to be done?," one does not risk a charge of cynicism by suggesting that the most effective advocates for Notre Dame's recovering its senses will be alumni and other donors capable of withdrawing or withholding contributions in the range of seven, eight, or nine figures. It's funny how the conservative reaches so easily for the Communist revolutionary quote, like it was second nature. [In fact, the quote has Biblical echoes too]. Note also that his suggested strategy relies not on debate, but punishment. Compassionate conservatism, indeed. It's easy for [insert name here] Completely Pure Catholic College (or blogger) to avoid dilemmas (and mistakes) like Notre Dame's, because no one cares about that College (or blogger). Weigel would apparently rather that there not be a top ranked Catholic university like Notre Dame than one which would dare let a pro-choice President set foot on its campus. Enjoy the cocoon, dude. Is it possible that the actual draft of the original plan is just exactly as above, except with 9 more zeroes attached to all the numbers? UPDATE: Paul Krugman shows that things get more interesting when you attach probabilities to the numbers. 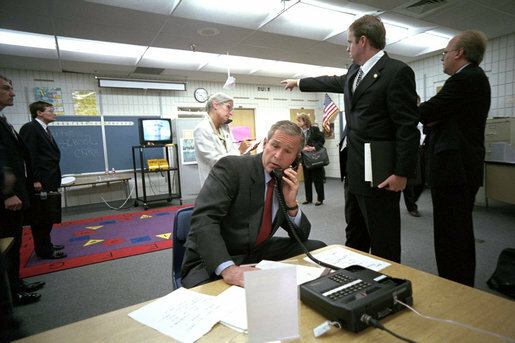 George W. Bush was blindsided by an executive branch decision to contract with Dubai Ports World, an Arab-owned company, to manage terminals in six American ports. While the interpretation is right, the description of the underlying facts is not. The Bush administration did not give any contracts to DPW. Instead, a committee charged with review of overseas takeovers of US entities approved the DPW takeover of P&O (itself a furrin company) which ran those 6 ports in the US. Summers was even more highhanded in addressing the “retention bonuses” handed to the very employees who brokered all those bad bets. The very employees who ran AIG into the ground are long gone. That's part of the problem. If we had negative bonuses for them, we'd be getting somewhere. UPDATE: It's been brought to our attention that the DPW imbroglio was eventually solved by selling the ports to ... AIG! So all the cool bloggers from Paul Krugman on down have bashed the emerging details of the US Treasury rescue plan for banks. Much of the complaints concern who will bear the losses from the distressed assets that would be offloaded under the plan. Note that the losses have to be borne by somebody, and in a world of limited liability, that somebody is not going to be shareholders and managers -- to the full extent of the losses -- no matter what you do. But the specific complaint is that the plan results in huge gains for the incumbent banks, since they get to dump all the bad assets onto the government. Last October, the Swiss central bank (SNB) took over $50 billion in bad Union Bank of Switzerland assets. The deal looks a lot like what the US Treasury is now proposing. The assets sit in a special purpose vehicle, StabFund, and SNB bears most of the risk of what the assets are worth. Third party valuation experts determined the sale price. The above is a chart of the UBS share price on the Swiss stock exchange over the last year, plus the market index (in orange). You'd be hard pressed to see the supposed windfall to UBS shareholders. But the government has kept the economy from tanking, and it has kept politicians from coming up with new bills every day of the week to determine managerial compensation in its banks. Let's give Geithner and Obama a chance. UPDATE: Brad DeLong defends the Geithner plan. FINAL UPDATE: So does Andrew Sullivan, for whom the chance to be in opposition to Paul Krugman seems irresistible. Suggestion to Sully: if Krugman picks a fight over this one, ask him if he still stands by his 2008 assessment of Gordon Brown. Maybe RBS should have bet all the taxpayer capital on Ireland and their problems would be solved. It's that kind of match. UPDATE: Superb stuff. Would have been a shame to lose on a penalty. That's company that Ireland doesn't want to be in. in one transaction, the Bank of Ireland "acquired nominal legal title" to shares of an AIG subsidiary called Maitengrove Finance while another AIG subsidiary "retained equitable title and beneficial ownership" of the shares "for federal income tax purposes." Indeed, the original kulturkampf was launched to crackdown on "backward" and superstitious religionists (AKA Catholics) who wouldn't cave into modernity, science, and the national interest as German protestant progressives understood it. Note how a 19th century cocktail of religious reformation and nationalism is being defined as "progressive". Apparently Barack Obama has taken up the baton. AIG has probably decided that it's not worth fighting the retroactive bonus confiscation at this point, but the actual legislation (H. R. 1586) appears to exclude "commission" from the definition of bonus. Thus, if the firm wanted to, it could restructure compensation for last year to have been based on the number of credit default swap contracts closed, label those payments commissions, and get its people paid that way. Which does raise the question of why they didn't structure the payments that way the first time. But with Congress making an utter fool of itself, maybe better late than never. Being an irresponsible non-JournoList approved blogger, we present the following associations. Make of them what you will. George Bush has a contract from Crown for a book tentatively titled Decision Points. (he really did love being The Decider, apparently). Crown is an imprint of Random House. Random House is owned by Bertelsmann AG. Bertelsmann AG collaborated with the Nazis. The US government was providing billions of dollars to Société Générale via the AIG credit default swap bailout during a period when the US Federal Reserve was not sure, and is still not entirely sure, that SocGen was complying with US money laundering provisions. If this was a crazy populist blog, we'd be claiming that this means that US taxpayer money could have been part of a money laundering enterprise. But this is a sedate and reflective blog so we won't. He should have checked with them before the AIG bailout, which, after all, was Bush's bailout. There was a St Patrick's day breakfast event in Washington DC hosted by the Northern Ireland USA delegation office. The co-First Ministers (for what's what they are, despite the titles) Martin McGuinness and Peter Robinson were there plus just about every elected official in Northern Ireland and Irish foreign minister Micheál Martin. As for the speeches, McGuinness left no doubt about his vehemently negative attitude to the dead-enders. At one point he even referred to how the government was "marching on", a nice sign that the prospect of "marching" has lost its old resonance. Happy St Patrick's Day. UPDATE: As rumoured a few weeks ago, Barack Obama has used the day to announce Dan Rooney as his Ambassador to Ireland. FINAL UPDATE: Ever thinking about the electoral ballot paper, Brian Cowen's banter with Barack Obama at the White House just now included his claim that he'd never want Obama running for election against him in Laois-Offaly. FOREIGN MINISTER MARTIN: First of all, we warmly welcomed the decision to close Guantanamo, and indeed Ireland was one of the first countries out calling for its closure. The problem is that the meaningless me-firstism that he cited has to be put in context of Ireland's tacit cooperation with Gitmo through the rendition flights at Shannon, for which the government has dodged accountability by demanding "evidence" knowing full well that the US won't provide it. Perhaps Minister Martin is promising full cooperation with Binyam Mohamed's legal team? How many Middle East envoys does Obama have? In this official Saudi news agency picture, King Abdullah meets John Brennan to get a "message" from Barack Obama. Interestingly, both Brennan's job and those of the Saudi attendees at the meeting would rank as interior counterterrorism stuff and not diplomacy. It seems that Brennan also went to Yemen. This suggests that something is being cooked up about Guantanamo Bay. The odd thing is, it sounded like Daniel Fried had been given the Gitmo closure job. As a last resort, Zardari tried to use the American pressure. It was surprising for Zardari that some top US government officials never used any “pressure” on Nawaz Sharif and they just tried to mediate. What must have gone on in the Bush days? There must be a reasonable explanation as to why AIG describes its common stock as being listed on the Irish Stock Exchange but the ISE shows a share price of zero and apparently not much trading, ever. Should Gordon Brown be told? UPDATE: Don't forget that Irish-registered entities were bit-players in a previous AIG imbroglio. Note the contradiction: the bailed out banks should be run as businesses, but the government gets to tell them what to do. Sixty suits in Sussex didn't resolve that problem. This New York Times "political memo" remarks on the abundance of reporting of trivia about White House personalities. Apparently the newsworthiness of the trivia comes because "a lot of Web sites, bloggers and Twitterers have deemed these developments so", even though nearly all but two examples cited come from actual established media enterprises. The examples cited also cover the period when most of the media, as correctly pointed out by various National Review types, were ignoring the Charles Freeman "Lobby" imbroglio. New York Times and Washington Post readers only found out about the affair when it concluded, but blog readers had known about as it unfolded. It does make one wonder whether the prime audience for the people writing the trivia stories is themselves. Single Markets Commissioner Charlie McCreevy, who sneered at the idea of reading the Lisbon Treaty and who was Minister for Finance in the critical period when Ireland's tech boom became a property bubble, living it up at the Cheltenham race meeting yesterday. That purple tag is presumably his special box access. Apparently Queen Elizabeth was in the box above Charlie's. This ability of the Irish privileged class to locate themselves below the English elite is a critical element of their faux populism, and is as persistent a consequence of our period in the UK on Irish politics as the Northern Ireland situation. Mr. Cohen was counseling Lehman Brothers until it sought bankruptcy protection Sept. 15, and then pivoted to represent Barclays, which ended up buying the failed investment bank's U.S. operations. Meaning that there's no one in a better position to know what happened to Barclays' request to the UK government to provide a bridging guarantee for its takeover of the not yet bankrupt Lehman for the few days that it needed to get a shareholder vote. Barclays never got the guarantee, and the rest is history. The evidence presented thus far by El Mundo is, to be sure, inconclusive. Yet, it strongly suggests that at least some in the Spanish police may know considerably more about who was really behind the 3/11 bombings — attacks that undid the electoral fortunes of the Spanish government, brought to power socialists hostile to its most important domestic and foreign policies and precipitated changes in those policies that could only encourage terrorists to interfere in elections elsewhere. Given the stakes for Spain, for its relations with the United States, and for the democratic world more generally, there should be few higher priorities than getting to the bottom of what may be Spain’s Terrorgate. As the current Spanish government might have reasons for resisting a no-holds-barred investigation, and those in Washington anxious to foster improved bilateral ties may be reluctant to press for one, it may fall to the sorts of citizen-activists and bloggers who thwarted Dan Rather’s notorious attempt to hijack America’s exercise of democracy in 2004 to find out precisely what happened to its Spanish counterpart. Yes, the heady days when what was then an only an embryonic stem cell of Pajamas Media types was going to unmask the alliance of terrorists, socialists, and Dan Rather which was out to destroy the free world. Members of the groups are mostly drawn from the mainstream I.R.A. and its hard-line offshoot, the so-called Provisionals, who were the main republican strike force during the 30 years of sectarian violence known here euphemistically as the Troubles. The "mainstream" IRA during the Troubles was the Provisional IRA. Incidentally, one remnant of the once mainstream "official" IRA, Sean Garland, is back in the news. But it's an era that most people have forgotten. And, given that shariah is anti-democracy, anti-equality, anti-freedom of conscience, and understood by a sizable number of Muslims to command jihadist attacks on the United States, is it really something we ought to be incorporating into American law? So there you have it. We're on the slippery slope to incorporating terrorism into American law. But anyway, how much is there to this product? The discussion (admittedly at the mercy of the original article) seems to misunderstand what a mortgage is. It's a loan for the purchase of property where the lender owns the property until the loan is paid off. So in principle, there is no necessary connection between a mortgage and the payment of interest. There could be no-interest mortgages. But mortgages still raise concerns in Islamic law because of the distribution of risk; as a rule, everyone in a Sharia-compliant transaction should be bearing some ownership risk throughout the life of the contract. And then there are the moral issues with which Islamic law is actually concerned, such as whether the borrower might be homeless if he can't repay the loan. By contrast, these Minnesota mortgages sound like simply a technical wheeze with the numbers that don't address the deeper questions. Unfortunately, if the above is indicative of how the right is going to react to the slightest broaching of these issues, they'll be in full Rowan Williams outrage mode when the more serious issues get discussed. And don't forget the fact that religious edicts are already embedded in law, such as usury laws, not to mention widespread notions of "fairness" in law that could be traced back to religious roots. Perhaps they get in under the old "Judeo-Christian tradition" loophole. UPDATE: In a nice synergy given the theme of this post, here's Rowan Williams from a few days ago ruminating, inter alia, on the connection between capitalist notions of risk and Christian ethics. The greatest tyranny has the smallest beginnings. From precedents overlooked, from remonstrances despised, from grievances treated with ridicule, from powerless men oppressed with impunity, and overbearing men tolerated with complaisance, springs the tyrannical usage which generations of wise and good men may hereafter perceive and lament and resist in vain. At present, common minds no more see a crushing tyranny in a trivial unfairness or a ludicrous indignity, than the eye uninformed by reason can discern the oak in the acorn, or the utter desolation of winter in the first autumnal fall. Hence the necessity of denouncing with unwearied and even troublesome perseverance a single act of oppression. Let it alone, and it stands on record. The country has allowed it, and when it is at last provoked to a late indignation it finds itself gagged with the record of its own ill compliance. It's stirring stuff. But it could be about anything; one suspects it's circulating on right-wing e-mail lists in an anti-Obama usage. But it's a bit sloppy of them to spring the quote without a subject. So a little detective work through the Times archive (which unfortunately charges for access) indicates that the subject was one of several Poor Law relief scandals, springing in particular from the desire of the government to make welfare as painful as possible and to run care for the mentally ill on a for-profit basis. The Times was apparently against. But aren't they things that the Journal editorial page would favour? Of course the people of Northern Ireland have long practice in dealing with terrorist violence. But as this evening's events in Craigavon indicate, there is apparently a serial aspect to the latest incidents that must have lots of people on edge. This reflection on what the experience of the Washington DC sniper case was like gets at that feeling of how easy it is for a small number of people to spread a feeling of dread. Gordon Brown has stressed that the peace process in Northern Ireland is still working, as he visited the country following the deaths of two soldiers in a terrorist attack. Insurance is the oxygen of the free enterprise system. Without the promise of protection against life’s adversities, the fundamentals of capitalism are undermined. There is one prominent African-American endorser who made reference to a two year decision process: Colin Powell. But note that you have to read carefully to see that the Telegraph is not even quoting Powell directly, but someone else's version of what Powell allegedly said. So how about it Tim -- are you willing to name a single source for the story, or is the flood of links from conservative websites gratification enough? UPDATE: Sister paper the Daily Telegraph seems to have a source close to Gordon Brown, specifically with relevance to the wrong region DVD fiasco. Note the link in theme between the stories is the perception that Brown was poorly received in the US. This Proposition 8, this attempt to undo the good that has been done. This attempt to create divorces among 18,000 people who were perfectly legally brought together in partnerships, this is unacceptable and shows me why we always have to be vigilant, why we have always got to fight homophobic behaviour and any form of discrimination. Divorces? If Prop 8. is upheld, the legal status of those marriages would be annulment, not divorce. Legally, they'll never have happened. As the distinction plays a crucial role in British (and Irish) history, you'd think he'd be careful about the difference. UPDATE: Andrew Sullivan explains why Brown's comments are shite even on their own terms. MR. BROWN: Thank you very much, and thank you for being so patient. We met today as an International Monetary and Finance Committee at a time of global economic challenge, with world growth strong not least because of continued expansion here in Asia. It is a time of opportunity, but there are also heightened global risks. Global economic imbalances persist and the threat of their unwinding remains. Global inflation is rising, with upward revisions to over half of all country forecasts in the World Economic Outlook. Further sustained rises in oil and energy prices since our Spring Meetings have created risks to world growth. Perhaps the most worrying for the long term, worrying for growth in all areas of the world, is the stalling of the Doha Round of world trade talks. A Doha deal never did get done, partly due to objections from India. But that's not what brought the roof down. George W. Bush’s greatest moment in his presidency was still months off. Federal Reserve Vice Chairman Donald L. Kohn explained all the Fed's transactions with AIG to the Committee on Banking, Housing, and Urban Affairs of the U.S. Senate today. It's headache-inducing. But what it amounts to is: sure, we bought all this toxic shite from AIG (and Bear Stearns). But we dumped it into companies with cool names: Maiden Lane I-III. UPDATE 24 APRIL: Maiden Lane: cool name, shame about the losses. But how much safer would everybody’s savings be if the whole world finally came together to outlaw shadow banking systems and offshore tax havens? Outlaw is a pretty strong word. "Shadow banking system" is generally taken to mean the creation of various assets that might seem more liquid than they really are. But the financial industry creates asset vehicles all the time and no one is likely to be taken in by claims of liquidity that might attach themselves to such assets at this stage of the crisis -- at least not without doing some real research first. And which tax havens is he talking about? The UK dependencies? The Caribbean? The Republic of Ireland and Luxembourg? It'll be interesting to see what exactly he's proposing to outlaw. But nothing in the potential list addresses the question of what should be done about policymakers who watched financial sector balance sheets explode for ten years, 1997-2007, and did nothing about it. It's funny watching the reactionaries fight among themselves over whether Rush Limbaugh helps or hurts their cause. But the weight of opinion among them seems to be that he helps. For an idea of what this buys into, start watching from the 1 hour 20 minute mark of his weekend Conservative Political Action Conference performance [sorry, link repaired]. Did he declare that ego in customs? There was a Gordon Brown interview on American National Public Radio this morning, done live from the UK Embassy and linked to Brown's visit to Barack Obama today. The critical point was 5 minutes in where the interviewer pointed to the fact that Brown had been in charge of the economy for 10 years as chancellor during the time at which consumer and corporate debt was piling up. This was Brown's latest chance to show a little acceptance of responsibility. Instead he seized on the imprecision of the reference to corporate debt: "our corporations were certainly not borrowing too much", which is disengenous because he knows quite well that the claim is only correct for non-financial corporations; as Martin Wolf has repeatedly pointed out, Britain's financial corporations were on a massive debt spree. Brown then went on to repeat his claim that the real problem of the last ten years is that other countries hadn't done what "we" (i.e. he) had wanted to do in terms of international supervision of the financial sector. We don't even get a copy editor? This is Palestinian UK resident Manal Timraz (and her son) who lost 15 relatives in an Israeli airstrike in the Gaza strip. In part response to a memorial drive that she launched, Qatar Airways is naming the new plane behind them "Gaza". The plane will fly the Houston-Doha direct route. It would be nice if the oil men sitting inside got to see the name displayed a bit more prominently, but there is something clever about using the plane on a Texas route. Isn't this an obvious candidate for some right-wing "outrage"? FDR took office in the midst of a total meltdown of the banking system and acted boldly to arrest it. In March 1933, the Dow was at 52. It climbed 75 percent in the first 100 days. By December 1, 1933 it was 99. Obama is temporizing with his financial crisis in favor of moving quickly on his big spending plans, and watching the Dow trip steadily downward by the day. What did FDR do in those critical 9 months? He closed all banks for nearly a week, confiscated most privately-held gold, forced a separation of commercial and investment banking, brought in interest rate controls and de facto deposit insurance, and devalued the US dollar in the Gold Standard. Yet in the current economic crisis, the one policymaker taboo is telling managers, debt holders, and counterparties to large financial institutions that the jig is up. Note in particular that AIG's continual need for cash is due to the fact that the same ratings agency geniuses who rated it AAA in a boom keep downgrading it in a recession, forcing it to post more collateral for the financial institutions on the other side of its contracts. Isn't it time to tell those other institutions to piss off? But which one? It's Prince Turki bin Faisal bin Turki bin Abdulaziz Al Saud. But there are two people with that name. There's the elder Prince Turki, brother of Crown Prince Sultan and one of the Sudairi Seven. But there's also the younger Prince Turki (the elder's son?) and going by age given for the deceased in this report from Qatar, it might be him. An untimely death for him would be grist for the mill on the 9/11 conspiracy theories. He had also been recently in the lead on expressing Saudi frustration with the Israel-Palestine peace (sic) process (sic), and had never been a fan of the neocons, for which the feeling was mutual. UPDATE April 4: The younger Prince Turki (al-Faisal) has popped up on a visit to Jordan so it's not him.